Atkin Guitars are sponsoring the Americana Awards, and we will be presenting a very special British music legend with a custom made, leather bound guitar in conjunction with the Buddy Holly Music Foundation. The Americana Music Association promotes and celebrates Roots music, blues and more in the UK and Atkin players Chris Difford and Boo Hewedine will be involved this year. We'll have guitars in the Hackney House bar ready to play...and a few backstage in the green room at the main event. We delivered two guitars to Peter Gabriel's Real World studios in Bath. Graham Gouldman and Kevin Montgomery received their Atkin J45's from the Buddy Holly Educational Foundation. Elvis Costello received his new Atkin J45, which was presented to him by Peter Bradley Jr of The Buddy Holly Educational Foundation in Harrogate. Elvis used the guitar for the rest of the tour. Paul McCartney with his Atkin J45. Peter Bradley Junior of The Buddy Holly Educational Foundation travelled to Buddy's home town of Lubbock Texas to present Paul with one of our Handmade custom guitars. Buddy's widow Maria Elena Holly was also there for this historic occasion. This was the first time Paul had played in Lubbock. In October 2014 we built a guitar for Paul McCartney. This Custom J45 was Mahogany throughout and was hand painted by Canterbury Artist Andy Howe. The Buddy Holly educational Foundation commissioned the guitar which would usually sport a Leather outer cover. However, due to Paul's Animal Rights Campaigning we developed a new design. The painted cover is an amazing replica of Buddy's original guitar. British publication 'Acoustic Magazine' select our 'White Rice' model for the cover of their September issue. The magazine featured a review of both our relic and new 'White Rice' guitars. Mark Nevin's album cover for Beautiful Guitars featuring 'The Beautiful Guitar'. With Vic Lee's amazing Pen Drawings. Mark Nevin from Fairground Attraction asked us to build a guitar for his album cover. So together with artist Vic Lee we came up with this. Vic's style really set the guitar off and made a truly original piece of work. This project set us off in a new direction. We were asked by The Buddy Holly Educational Foundation to attend a presentation at Abbey Road Recording Studio in London. Albert Lee was presented with one of our guitars by Radio 2 DJ Johnny Walker. The presentation was in Studio 3 where Pink Floyd recorded 'Dark Side of The Moon'. Also in attendance were Bruce Welch, Allan Clarke, Mike Berry and Chris Difford. Dolly Parton becomes a lifetime patron of The Buddy Holly Educational Foundation. She is presented with one of our custom J45 guitars 'Maybe Baby'. The Atkin Dust Bowl model gets a glowing review by Gerry Uwins in Guitar and Bass Magazine. Designed as a guitar to fit the times we were living in, much like the 'Depression Era' guitars Gibson made in the 1930's. BBC Folk award winner ' Jim Moray' is featured on the cover of Acoustic Magazine with his Atkin OM Custom. Richard Hawley releases his album 'Truelove's Gutter' featuring his Three Atkin Guitars. Richard ordered this Black Jumbo custom especially for the album, it features his name inlayed in pearl on the fretboard. We build one of our OM custom guitars for Graham Coxon of Blur. Graham goes on to use it on tour and for some of the promotional videos for his album 'Spinning Top'. Mark Potter of Elbow buys an Atkin OM rosewood model guitar and uses it on the video of "The Bones of You". 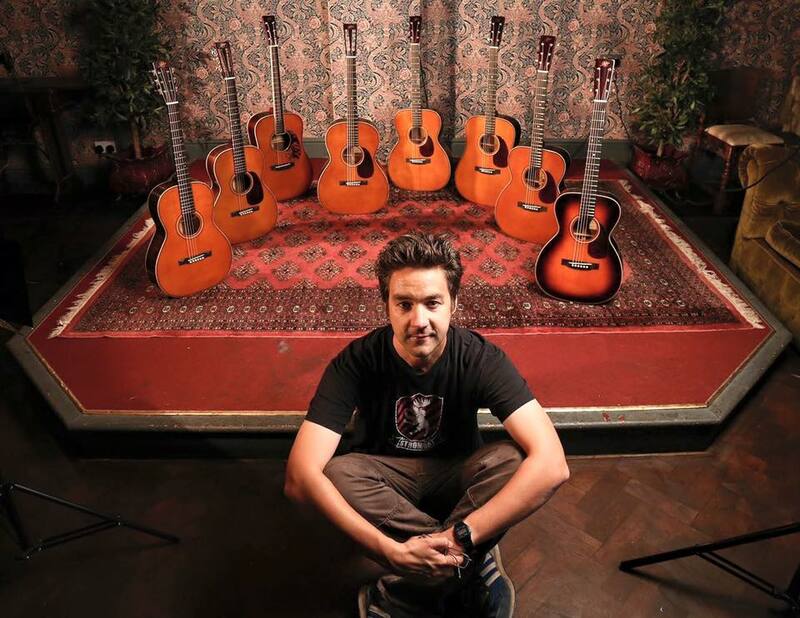 Alister was delivering Richard Hawley's new guitar back stage at the Brixton Academy while on tour with Elbow. The boys were in the middle of a major breakthrough album which would see them catapulted to the top of the music business. Their album 'The Seldom Seen Kid' went on to win just about every award going. Richard Hawley appears on "Later with Jools Holland" playing his brand new Atkin OM custom guitar on 'Tonight The Streets are Ours'. Richard goes on to order two more custom guitars from us which feature heavily on his 2009 album 'Truelove's Gutter'. Atkin Player Kate Walsh reaches the top of the iTunes chart with her album 'Tim's House'. Kate had been playing her three Atkin Guitars for a number of years. Her single 'Your Song' appeared in a number of TV shows and Movie soundtracks. An Atkin Dreadnought was used for the new James Bond theme tune 'You Know My Name' by Chris Cornell. The guitar can be heard in the backing track of the song. The long awaited 'Casino Royale' is Daniel Craig's first outing as Bond. Sinead O'Connor uses an Atkin for her Live DVD 'Goodnight, Thank You, You've Been a Lovely Audience'. The cover of the DVD also features Sinead holding the guitar. Eddi Reader buys her first Atkin guitar. Interview with Guitar Buyer Magazine. Boo Hewerdine collects his first Atkin Guitar. Boo has written with so many artists over the years and has been a full time member of Eddi Reader's band for the past 20 years. Boo's first Atkin was an OM rosewood model. Boo went on to introduce us to Chris Difford, Eddi Reader, Neill and Callum MacColl, Kris Drever and many others. Alister Atkin with one of the first Pre-War OM guitars back in the days of bleached hair. This photo shoot was taken by Jon Case of Case Guitars back when he was a graphic designer. These guitars went out to a dealer in Germany. ndy Mitchell comes to the workshop to pick up his new Atkin OM Custom guitar. Andy and Alister had been friends for some years, and at this time Andy had started writing and performing full time, Andy is a key figure in the Atkin story. Andy introduced Chrysalis stable mate Boo Hewerdine to Atkin Guitars. This chance meeting would go on to connect Atkin up with some of the most popular musicians in England, while Andy went on to become the lead singer of the Yardbirds. The local newspaper writes the first article about Atkin Guitars. They talk to Alister Atkin about his hopes and dreams for his new career. Alister Atkin left the London School of Furniture and rented a space in Andy Crockett's workshop in Stourmouth just outside Canterbury. At this stage Alister had built one classical and a couple of electric guitars. Alister's ambition was to build steel string acoustics. In the summer of 1995 he purchased the wood to build his first HD 28. With the help of Andy Crockett and Irving Sloane's "Steel String Guitar Construction" the first Atkin Steel String was born. These early guitars were built entirely by hand using time honoured traditional methods.